This Reference Article defines and explains the topic of TEKLYNX Single User and Network licenses. They all share the same licensing philosophy. They are all available in either Singles User and Network licenses. The software is the same. The difference is how the software enforces the licensing. Single User – When deployed as a single user, TEKLYNX software is installed on one PC. Any number of Windows users can login to the workstation and access the software, but just one user can use it at a time. They can also print to an unlimited number of printers*. (One at a time) The license in enforced by either a soft key (hidden somewhere on the computer hard-drive) or on a USB dongle. For soft key licenses, the TEKLYNX label software will expect, during the activation process, a license activation key intended for a single user license. The software must then be run directly on that PC. Remote connections (e.g. RDP sessions) will prevent the TEKLYNX label software from using the activation key (either soft or USB). *The one exception is CODESOFT Pro, which is limited to three (3) PRINTERS. The other products can print to an unlimited number of printers. CODESOFT Enterprise is also unlimited. Network – When deployed as a network license, the same TEKLYNX software is installed on one or several PCs. However, for network licenses, TEKLYNX requires the installation of an additional software component (no extra charge) called Network Utilities. The activation key for the license (either softkey or USB key) is applied to the Network Utilities application (not through label software). Once the Network Utilities license is activated, all the TEKLYNX labeling software applications must be directed (using settings) to the server location of that Network Utilities. The network utilities application waits for a client (typically running on a PC) TEKLYNX label software application to contact it and requests an approval to open and run. Network Utilities looks that total number of ‘users’ that are available in the license, deducts the number of ‘users’ currently running the software on the client/PC computers, and determines the number of additional client/PC computers that are allowed to run the label software. If someone opens the label software on a client/PC and it contacts Network Utilities to open but the number of ‘users’ (i.e. other computers) has already hit the maximum allowed in the license, Network Utilities will reject the new label software request and thus the software will fail to open and give the user an error message. 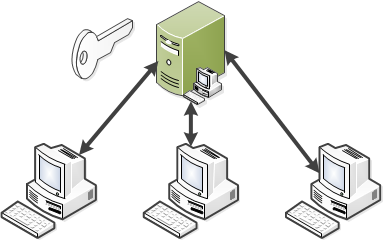 However, if someone were to close one of the currently opened label software applications running on client/PC and thus occupying one of the ‘users’ available in the license, the ‘user’ license would be free to assign to another computer. That same user who was rejected by Network Utilities should be able to open their software now.